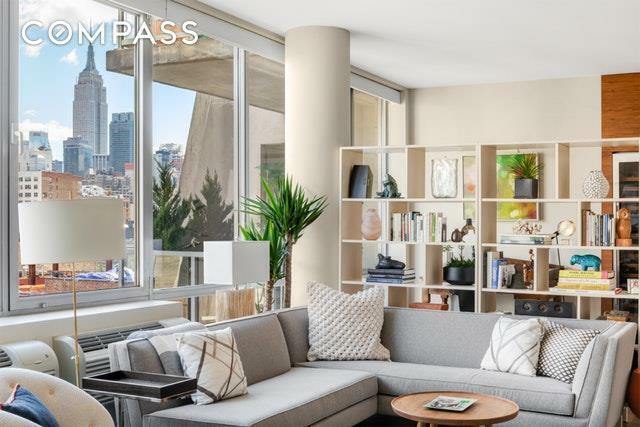 This high-floor, move-in-ready beauty with three large balconies, big views, exceptional light AND private parking in The Chelsea Club Condominium truly has it all. 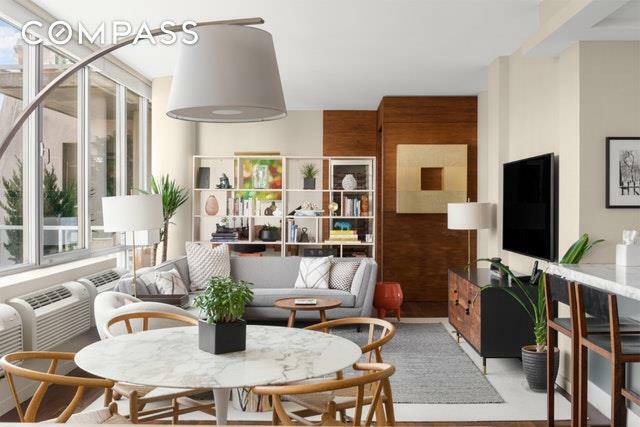 The elevator opens directly into an entry area that reveals the sizable great room - with almost 40 feet of frontage - with large windows that flood the apartment with dreamy northern light all day long. 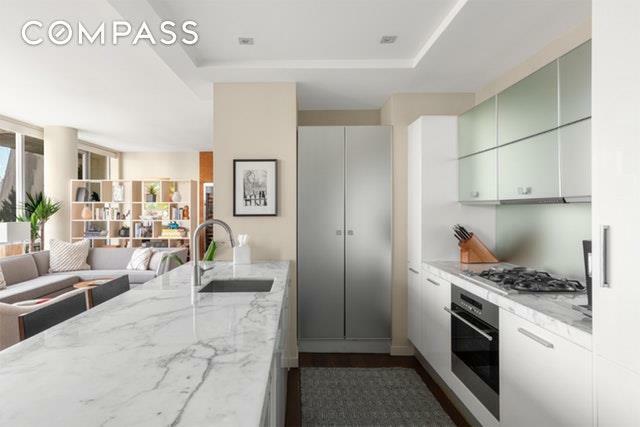 The dramatic views towards Midtown New York are truly inspiring as they transform from postcard-perfect daytime to dramatic evening twinkling city lights.The open kitchen features sleek white lacquered Cucina cabinets, marble countertops, and Wolf and Sub-Zero appliances. There is a built-in Sub-Zero wine cooler for 136 bottles. The Master bedroom features an en suite bathroom that is both sleek and timeless, with a large walk-in shower with two rain-head showers and a built-in bench. A large balcony provides the perfect oasis away from it all. Two walk-in closets provide ample storage. A second bedroom with a large closet/home office and another bathroom complete the picture.There is a Control 4 Home Automated System as well as Sonos speakers in select areas. A Washer/Drier is in the apartment located in a large pantry closet. The building boasts a 24-hour doorman who greets you in the elegant lobby with its resident's lounge, an outstanding superintendent, a fitness center, plus an impressive roof deck overlooking all of West Chelsea with its vast array of art galleries, the Highline Park, The Hudson River Park, and a new Six Senses Hotel and Spa. 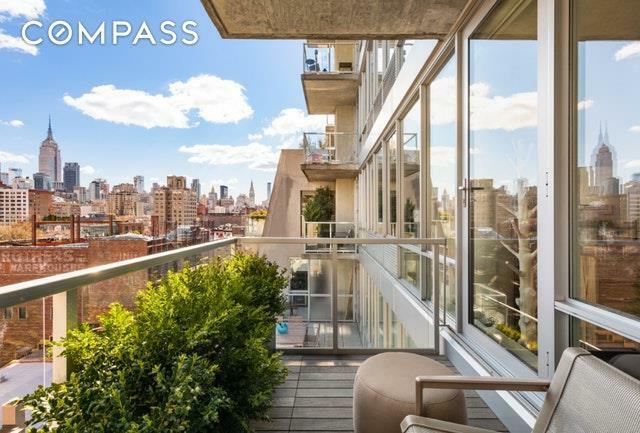 Located moments from the newly opened Hudson Yards, Chelsea Market, Chelsea Piers, Google Headquarters, the Meatpacking District and anything and everything a prime neighborhood should deliver. Pier 55, a floating park in the Hudson River will open soon and provide an additional neighborhood amenity. An approx. 40sf storage unit is also included. An elevator ride to the first floor leads you to the private garage with your titled parking spot.